What are African violets? African violets (Saintpaulia spp.) are popular flowering houseplants in the Gesneriad family (Gesneriaceae), native to Tanzania in East Africa. Their compact forms make them ideal for use on tabletops, windowsills, and hanging baskets. There are many varieties of African violets, including trailing and miniature varieties. African violets usually form rosettes of rounded, velvety leaves with scalloped edges on short fleshy leaf stems. Leaves are often dark green with red-tinted undersides, and sometimes are variegated. Small clusters of flowers surround the foliage in shades of pink, red, white, violet, purple, blue and bicolor. Flowers can be single, double, semi-double, fringed, star-shaped, and Geneva (edged in white). African violets have a reputation for being difficult to grow, but under suitable conditions they will thrive, producing long blooming flowers throughout much of the year. How do I care for African violets? African violets prefer locations with bright, indirect light. In a south or west exposure, plants need to be protected from direct sunlight during peak hours, or foliage will burn. If African violets do not form flower buds, they are likely not receiving enough light and should be moved to a sunnier location, or placed under artificial light. In particular, supplemental fluorescent or full spectrum lighting may be necessary in winter months to encourage year-round flowering. Position lights eight to 12 inches above plants, allowing 14 to 16 hours of light per day. African violets prefer 70-75°F days and 60-65°F nights. Place plants in a location with good air circulation, but keep them away from cold windows and cool drafts as sudden changes in temperature can harm the plants. African violets should be watered moderately from spring until fall, allowing soil to dry slightly between waterings. Reduce water slightly in winter months. Bottom water plants to avoid water splash on foliage, as cold water can damage leaves causing brown spots. Fill saucers with warm water, allow plants to soak up water for approximately 30 minutes, and drain off excess water once the soil is sufficiently moist. 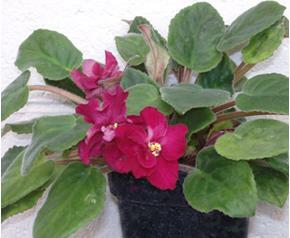 African violets are extremely susceptible to crown rots, which can rapidly kill the plants. To prevent crown rots, avoid overwatering, avoid watering directly into the crown, and avoid watering at night. African violets grow best when potted in a well-drained, soilless potting mix or pre-packaged African violet mix. Keep plants slightly pot-bound to encourage flowering. Use a pot that is approximately one half the width of the plant’s spread. When plants are in flower, apply a specially formulated African violet fertilizer once a month, following the label instructions of whatever fertilizer you select. Remove older flowers and leaves as they begin to wither to improve the aesthetics of the plant, and to prevent problems with Botrytis cinerea, the gray mold fungus (see University of Wisconsin Garden Facts X1122). *Completed as partial fulfillment of the requirements for Plant Pathology 699 – Plant Disease Diagnostics Clinic Special Topics at the University of Wisconsin Madison.